Are you looking to build a deck for your living space and need deck design ideas? Butler Home Improvement can help! Whether you are interested in synthetic decking or wood decking, our team of professionally trained specialists are happy to assist you in determining which solution is best for your home or commercial property. 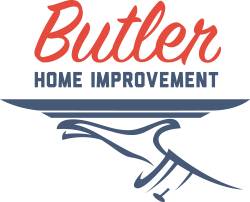 Butler Home Improvment has been providing deck installation for homeowners for more than two decades! Allow our team to help you with deck installation, decking accents, and accessories to make your outdoor living space truly unique and spectacular. If you are considering deck installation or are interested in adding accessories to your existing deck, it’s likely that you are looking for guidance due to the multitude of options. For many homeowners, the beauty, ultra-low maintenance, and durability of synthetic decking is the right choice. For others, a treated wood deck is an attractive, less expensive option. Either way, Butler can explain the advantages and disadvantages of each so that you’re able to make the decision that works best for your property. Butler Home Improvement has been in business since 1996 – offering experienced, professional deck installation service advice you can count on when improving your outdoor living spaces. When you pick deck accents and accessories, you should be offered an outstanding selection and expert advice. After all, the accents – like railings and deck lighting – are often what makes your deck unique. Butler Home Improvement serves St Louis, St Charles, O’Fallon, Collinsville, Edwardsville, Belleville, and the surrounding areas with high-quality deck construction, contact us today to get started! My sincere thanks for a beautiful deck. The team was wonderful! My special thanks to Jamie and David. David managed the job like it was done at his own home. I felt like I had a family working for me. I couldn’t be more happy and confident. Wishing you all a very happy, healthy and prosperous holiday! We loved our covered deck and wanted to keep the unique ceiling and floor but were worried a sunroom would change it. We toyed with screening it ourselves and knew we wouldn’t do it justice. We talked to Claudia from Butler Home Improvement at a local home show and immediately felt a connection with her. She came to our home and measured and measured and then her project manager measured again! There was ABSOLUTELY no pressure from Claudia or her staff. They didn’t try to upsell us and when we asked about updating the flooring they actually discouraged it. We were given plenty of time to think about the project. The project itself went extremely smooth and we were able to incorporate our existing floor and ceiling. Everything was explained to us in detail and we had everyone’s number if we had questions. We were a bit fearful of building debris because our 10-month-old grandson spent a lot of time with us. The site was as clean as possible and the team even worked around our landscaping, minimizing impact.